A home solar power system consists of multiple parts and components. Each individual unit plays a very important role. Among all the parts, the weak link in the entire system is none other than the battery bank. With today’s modern deep cycle batteries and sophisticated charge controlling devices, total battery bank failure is rare but they do happen. 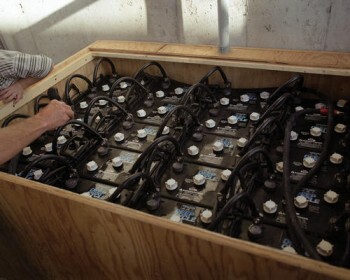 They following are 6 tips on how you can maintain the lifespan of a residential home solar energy battery bank. When designing your home solar power system, make sure you size the battery bank properly. Here’s a rule of thumb, design the batteries to be able to handle at least 5 days of load. It is always a good idea to size the battery larger than your home power demand. Reason being your power demand will increase after some time and the deep cycle batteries will lose it power output after a few years. Over designing the system will compensate for battery power loss and increased demand. 2) Invest in premium batteries. The batteries basically supply all the power when the sun is out. If possible, invest in high-quality batteries. It costs more compared to normal grade batteries but it will worth your investment in the long run. 3) Cut down on parallel stringing. When designing the battery bank, try not to have more than 3 parallel battery strings. Doing so, it system will lose its equalization thus resulting is rapid battery plates failure. When you have a problem with the battery system, it is hard to pinpoint which faulty plate is stealing power from surrounding cells and the entire system will suffer. 4) Watch out for corrosion. Corrosion on battery usually occurs on the terminals and cables. This can be a potential hazard and at the same time increases the resistance on the system. It is not very difficult to prevent corrosion on battery. All you need to do is apply a non hardening sealant on all the metal parts before connecting them together. The sealant will prevent acid from coming into contact with the metal surface therefore preventing corrosion. A deep cycle battery will lose up to 25% of its charge capacity when kept in a low surrounding temperate of 30 degree Fahrenheit. When the temperature rises, the battery will deteriorate faster. Therefore, it is best to keep the batteries in an ideal temperature. 6) Compensate for temperature changes. During winter time, the batteries are cold thus require a higher charge voltage limit in order to reach full charge. During summer, warm batteries require a lower voltage limit to prevent overcharging. This is known as temperature compensation. The temperature compensation process can be done automatically by many charge controllers in the market. When buying a charge controller, get one with the temperature compensation feature. Do you want to build your own home solar power system? If you do, download the 30 Solar and Wind Power For Homes Videos e-book. The e-book consists of videos showing your all the components needed to make your own DIY home solar system and wind generator. Click on the click below to download the e-book for free. ==> Click here to download free e-book now!